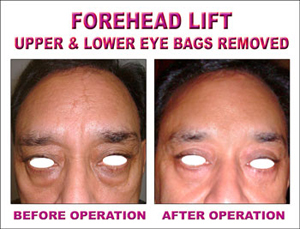 Cosmetic, Plastic surgery of your forehead will soften your horizontal forehead wrinkles and the scowl lines between your eyebrows. 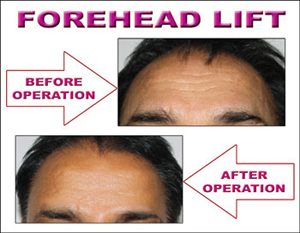 Brow lift (forehead lift) will raise your eyebrows to a higher and more aesthetic position. It will also improve lateral hoods (which are the droopy flaps of skin that hang over the outside corner of your eyes. It involves an incision across the top of your head. Through this incision, the muscles (frontalis, procerus, and corrugators) are altered that cause horizontal forehead wrinkles and scowling. After doing this, your surgeon will actually remove about a 1-2 cm strip of your scalp and sew the remaining scalp together. Although this may sound gruesome, it is the oldest and most reliable technique in brow lift surgery. The main disadvantage is that you will be numb on the top of your head for about six months, after which time the sensation usually returns. This technique also raises your hairline, which can be a problem for those with a high forehead who also wear their hair back. The advantages of this technique are that it is lasting (it will not have to be repeated as you age, with very rare exceptions). 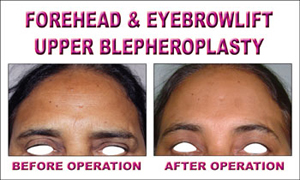 Also the scars are concealed behind the hairline and are not seen after they heal (unless you are a man with a receding hairline, in which case you should not have this kind of brow lift).